Bob Osborn, Brett Weigl, and I were on-site with the FFA at their National Convention from October 23-26 in Indianapolis. 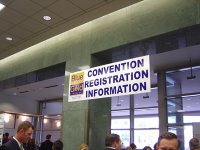 With over 50,000 attendees, this was the largest convention to date that used Register123 for on-site registration. FFA closed pre-registration on October 11, two weeks prior to the event. After that, attendees had to register on-site. 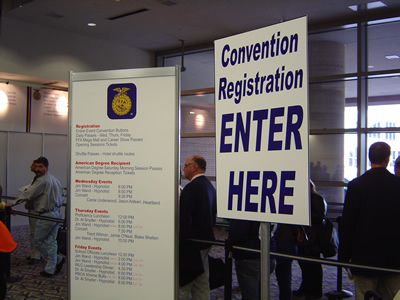 For an event of this size, these two weeks allowed the FFA staff to complete on-site preparations without a constant flux of registrations and cancellations. We flew into Indianapolis on Monday so that we could set up the Internet connections and confirm the system configuration. For the on-site event, we created special registration forms that focussed on rapid data entry rather than custom branding. On-site registrants started at the information desk. 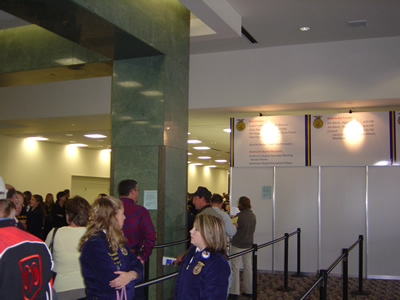 This area helped attendees determine if they needed to enter the registration line, if they needed to walk to the "Issues Desk", or if they simply needed to have name badges printed for exhibitors. Attendees who entered the Registration queue saw the event agenda twice. Sessions that had sold out were posted clearly so that people wouldn't try to buy tickets for unavailable sessions at the counter. Notice that only 1 row of the 5 set up in the queue was full. 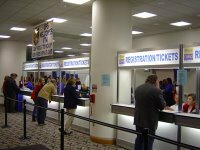 Lines and wait times were reduced by about 75% compared to 2005, mainly because so many more attendees participated in the new online registration process. People who did want to register on-site completed a paper form while in the registration line, so that they would be ready to purchase tickets when their turn came up. 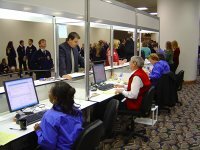 FFA set up 6 registration stations with 2 workers per station. Around the corner to the left is the "Issues Desk", which served people who lost tickets or needed to change their pre-registration order. 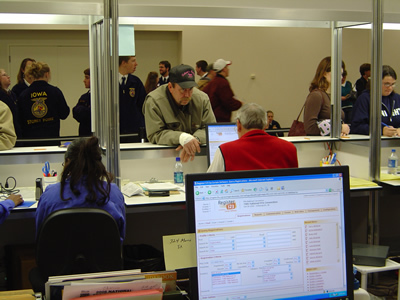 Because of the higher proportion of pre-registrations this year, the "Issues Desk" line was longer than in past years. Behind the counter, registration desk workers used the new "Admin-side Forms" in Register123 to quickly process on-site registrations, collect payment, and print out confirmations and receipts. FFA receives a large number of P.O., check, and cash payments on-site, although the percentage of credit card payments increased this year. After the front line workers entered the registration data, the system sent a "Pick Plan" to the back office workers. These employees selected the purchased tickets, bundled them with the registration materials, and met the attendee at the end of the registration desk. All transactions were monitored by FFA's registration manager (Sheridan Gilchrist) from a second-row PC station. 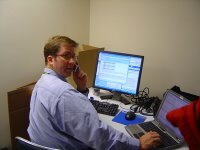 Meanwhile, I sat in the back-office at another monitoring station. Here I looked for issues and created special reports for FFA. This year was something of a learning experience for us, and these reports will become part of the standard features in Register123 for next years' events. Overall, the on-site registration process went very smoothly. 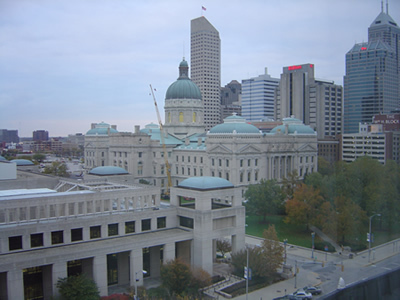 We lost Internet access on the first day for a few minutes, which was quickly addressed by the convention services. Now that Internet access is approaching the reliability of electricity in modern convention centers, the major problem with using an online registration system on-site is being eliminated. In 2007, we plan to reduce the number of manned registration stations from 6 to 4, and to add 2 "Self-serve registration kiosks". These kiosks will allow people to register themselves on-site via Register123, as long as they are paying by credit card. One FFA worker will "float" between the two self-serve kiosks, in order to help attendees who have trouble. This process should work much like the self-service check-in stations at airports. Also, we will likely add a second "Issues Counter", in order to handle the increased number of pre-registrants who need to make changes to their registrations on-site. Lastly, we will modify the on-site name badge printing form in order to reduce the number of steps required to print a name badge. Thanks to Register123's flexibility, these process changes can be configured without any software development.